*** Last of this design *** Long sleeve, double-sided print, white T-shirt with blue sleeves. The classic Evel Knievel Stars and Stripes "1" logo is on the front and a vintage poster with the quotes "I said that I would jump the Snake River when I was good and ready. Now I am ready" and "Evel Knievel the greatest stuntman and showman on earth" on the back. The edges of the shirt have a "damaged" effect to give it a worn, retro look. 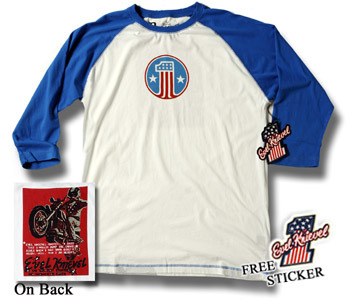 Includes a free Evel Knievel sticker. The fabric and manufacturing of this style of shirt is costlier than most, but we have negotiated a great price with our vendor and are passing it on to you. All Evel Knievel merchandise is officially licensed.